Dogwood trees are starting to bloom where I live and their blooms are so pretty! The Redbud trees are also blooming and their rich color looks so striking against the other trees that are just starting to produce small leaves. I decided to pick a few blooming branches and make a bouquet–something I had wanted to do last spring, but by the time I thought about doing it, the blooms were past their prime. So here’s how my “Branch Bouquet” turned out–I just combined 2 Dogwood branches with 3 Redbud branches and I think the different blooms look so pretty together! You could use other kinds of blooming branches, too–Forsythias, Pear Blossoms…whatever type of blooming branches that are growing around you. It brings a nice touch of the spring outdoors into your home or office. You could also use this idea to make a pretty Easter centerpiece for your table! Do you have any pretty blooming shrubs or trees in your yard? I’m linking this to Fiesta Friday, Inspire Me Monday, Wow Us Wednesday, Favorite Things Thursday. 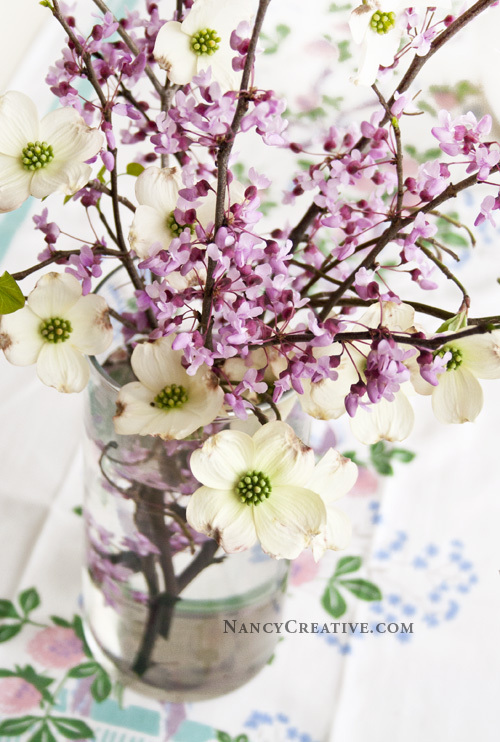 This entry was posted in Crafts, Decorating Ideas, Gardening, Seasonal, Spring/Easter and tagged blooming branches, bouquet, branch bouquet, Dogwood Trees, featured, Redbud Trees, Spring on April 18, 2014 by nancyc.